SSC CGL, as we all know, is one of the most awaited exams in a year. SSC CGL 2017 Tier-1 is scheduled from 1st August to 20th August 2017. All SSC aspirants are eagerly waiting for the exam and are also busy with the preparation. Are you prepared for the exam? How about preparing with 15 day study tips and tricks for SSC CGL? After receiving tons of requests to post an exhaustive SSC CGL study plan, we bring you SSC CGL 15 days preparation tips to make the best out of your efforts. As the SSC CGL exam is approaching, students need to start covering the SSC CGL syllabus and practice as many SSC CGL mock tests as possible. SSC CGL is one of the most competitive exams of all times with almost 15 lakh students appearing for 10,000 vacancies (approx.) last year (2016). So, to succeed in an exam like this, smart and streamlined efforts are highly necessary. 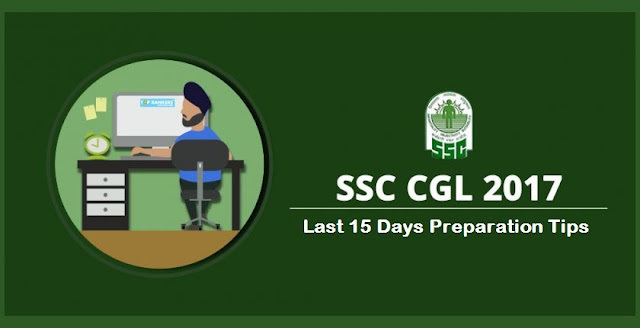 How to crack SSC CGL in 15 days- this question may make the candidates develop an aura of anxiety, fear and nervousness among themselves. Always remember, succeeding in SSC CGL is not only about scoring well in Maths, General Knowledge and English. If you wish to crack it, you also need to have a strong and smart approach. The SSC CGL Tier-1 comprises of 4 sections – General Intelligence & Reasoning, General Awareness, Quantitative Aptitude and English Comprehension. The nature of questions asked is objective type with multiple choices. For one correct answer, you win 2 marks and for one wrong answer you lose 0.50 marks. The candidates have to solve the complete paper (100 questions) in 60 minutes only. After looking at the pattern, you must have got a clear picture of the scenario. Quant and Reasoning sections will be more time taking as compared to other sections. So, you are asked to prioritize your order of attempt wisely. We will provide you an ideal time allocation strategy. Note- You can change the time allocation as per you own convenience. The above table contains an ideal time allocation plan which we suggest. Let us now move on to the SSC CGL 15 days preparation tips. Note- You can have your own daily schedule as per you own convenience. The above table contains suggestions only. In a span of 15 days, the best thing which you can do is concentrating more on the revision part rather than learning new topics. You can prepare short notes as well. · This section comprises of simple questions so it would be easy to score. · The questions in this section are less time taking as compared to questions from Aptitude questions in SSC exams. So, you can attend the reasoning section at first and then attempt quant section. · Practice as many questions as possible from all the important topics of reasoning. Practice with mock tests and SSC CGL previous year question papers. · Polish your reasoning skills by improving your concentration and critical thinking skills. Try to figure out the logic behind the question and read the question multiple times. Coupon Code : You May use Coupon Code "QMATHS" to Avail 10 % Instant Discount. · Quantitative Aptitude Section consists of questions with numerical ability. · Note down all important mathematical formulas and shortcut tricks which you require to solve those questions. · This section is more time consuming and requires good accuracy. You need to improve your accuracy by preparing from mock tests and question papers. · Prepare a strategy for QA section while giving the exam. Understand the pattern of the questions asked and figure out the questions which are lengthy. If you are unable to answer, skip them and move on to next questions. · Practice as many questions as possible from all the important topics of quant. Practice with mock tests and SSC CGL previous year question papers. · SSC CGL’s general awareness section contains most of the part from Static GK, You can focus more on static GK (history, geography, etc.) as compared to current affairs. · Read daily current affairs or current affairs of last 3 months by going through qmaths website, magazines, current affairs PDFs, etc. · Practice questions from last year GK quiz and question banks. Practice with SSC CGL mock tests and SSC CGL previous year question papers to know the pattern asked. · Make it a habit to read/watch/speak English in your daily life. Learn spoken English by inculcating a habit of reading newspapers, novels, online reading etc. · The grammar section is the toughest in English language. Pick up a standard book to go through basics of grammar and practice questions from grammar. · Attempt online tests to improve your English Skills. · Focus on vocabulary skills. Pick up a standard book for vocabulary and learn new words. Stay tuned for more updates on SSC CGL 2017 Tier-1 15 days preparation tips. All the best! N.S. : This 15 days preparation Tips is Shared by Team TopRankers to us.